This preamp has improved EVERYTHING I have put through it sound- wise. My untreated basement studio and solid performances aside, this preamp has brought character to my recordings. Finding that sweet spot on the 'blend' knob for a source still makes me smile.. it's a beautiful thing. Great sound and versatility. I love the tube sound on acoustic guitars, vocals and any acoustic instrument. I also love it when I track the line for an electric guitar to use with amp emulation: it adds that warmth that can't be achieved with the digital saturation/drive of the emulation. Tried it on Vocals, Electric bass and El. Guitar Cabinet and Acoustic Guitar and it sounds awesome! It can go from very clean sound to a bit dirty, from fat and boomy to more bright and sweet. I own this for a very short time but I am sure will help me bring my productions to a whole new level! 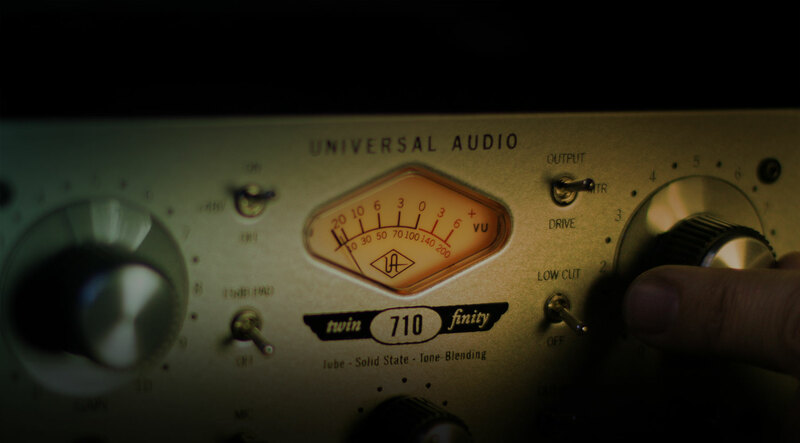 el 710 es un excelente preamp con gran versatilidad, los tonos que se pueden conseguir son infinitos gracias a que podemos hacer mezclas de transistor o tubo. Funciona muy bien como caja directa para grabar bajos y guitarras. I have bougth this one to find out how good it works. Great one, it works with a Neuman u87 AI perfect. So i decide to buy a twin finity 4-710d. Next days it will comes from my dealer.The UAD 2 Solo from this Bundel i have bought is very usefull too. So i believe someone ask himself why me is giving 4 Stars for this and other products of UA ? The whole Videos, Handbooks, Hints are all in English. I miss a German translation :(. German translation will makes thinks better understanding and working for me. Great work UA, thx for that. Por lo demÃ¡s es fantÃ¡stico. Good Sounds look and good low cut . Ce sont des petits bijoux. Facile d'accÃ©s, possibilitÃ© ou pas d'utiliser la lampe! Vraiment un rapport /qualitÃ© prix trÃ¨s bon. C'est du bonheur de faire des prise de son dans mon home studio! I've had this unit for a while now and it has been a heck of a preamp. No wonder they are still selling them. Great tones and clean sound. I first had the UA twinfinity 710, but sent it back for a Solo 610, which works very well. However i realised i also like the product of the 710, as it is a very good pre amp, so I decided i wanted, so i re purchased it. iI find that UA products are well made and perform very well. Every Little Thing UA Does IS Magic. So, I've been engineering for a while now and one of my pet peeves has always been getting a great hat sound. This was the motivation behind grabbing the 710. It only took a few minutes to dial in the sound I've been hearing in my head all these years. And don't get me wrong, this pre sounds great on guitars too! Very versatile box. Just recently purchased UAD Arrow with this 710 and I must say..... it’s the only way to go if you’re the type that love having desk space. Sounds that I’ve achieved with the Neumann TLM 102 and the slate microphone through this pre - amp are phenomenal ! I recommend all to have this setup ! I do not hear Universal Audio quality! I have two 710 devices and unfortunately I have to say that I am very disappointed. When a device it starts to crack when I turn the poti. I rarely use them. The fact that these devices are so vulnerable may have something to do with the fact that they are "Made in China" and not like other devices (610 Mark2) are not made in-house. I will try to resell these devices and would not recommend them for these devices. The character difference between clean and with tube are very very small. That's why I bought these preamps. You have to be very careful with the tube sound. Already in the middle position it can come in the mix to distortions which are very quiet when recording. But these come after compressing extremely forward. It is best to operate this preamp clean. Who has the money should rather buy a LA 610 Mark 2. Worth every penny but this preamp is not for me Universal Audio Preamp! Je l'ai acheté il y a quelques années avec ma première UAD2 et je m'en sers pour tout. Voix, bien-sûr mais aussi mes basses, mes guitares avec ce petit "growl" bien chaleureux de la petite lampe (que je changerai peut-être un jour au profit d'un modèle légèrement plus chaud encore). Je l'adore, c'est mon petit pote qui fait tout à la maison sauf le ménage, ça ce sont les plugs UA qui s'en chargent et avec tout autant de brio.